Daughter of an English mother (Ehtel Pape-Laughton) and an unknown father. Her mother's German husband lived elsewhere for several years and can't have been the father. During her school years she took ballet lessons without telling her mother. When the First World War broke out the family was in Magdeburg and was unable to return to England. They lived in Berlin during the war and Lilian stayed with an aunt in Switzerland. During the twenties and the thirties she played in many romantic movies like "Zwei Herzen in Dreivierteltakt". Before she made herself a name as an actress she also worked as a dancer in Vienna and Budapest. From 1932 onwards she lived with director Paul Martin. During the thirties she went to Hollywood but the movies she made there were little succesful. Back in Germany she helped choreographer Jens Keith out of prison ans supported his flight to Switzerland. She was subsequently arrested and watched by the nazi's. After she protested with Goebbels she was left in peace, but the nazi's considered her unreliable. In 1938 she and Martin split up. In 1941 she travelled to Lissabon and from there she emigrated to the United States. She lost her German citizenship in 1943 and her fortune was confiscated. During the second part of the forties she performed in Europe again and in 1949 she first came back to Germany. In 1957 she was awarded a pension to compensate for her fortune. In 1953 she had married the Danish theatre agent Hartvig Valeur-Larsen, but she divorced him in 1957. She had met Else 'Pitty' Wirth through Tamara Streck. Wirth was Streck's lover and she answered Harvey's correspondence and did other small jobs for her. When Harvey invited Wirth and Streck to her house, Streck made sexual advances to Harvey and was thrown out. Else Wirth stayed and became Harvey's companion in life. From 1957 until 1961 Harvey quietly lived with Wirth at Juan-les-Pins. Wirth's influence over Harvey grew and her enemies stated that she blackmailed Harvey with details that she knew from her life. In 1961 she returned to the theatre, but the public and the critics were less than enthousiastic. In 1967 she received a Bambi for her work. 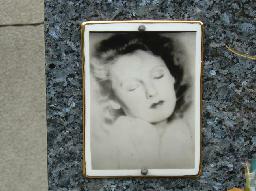 But by that time she addicted to alcohol and she died in 1968 from jaundice. Else Wirth inherited her fortune. In 1985 an accusation of fraud was made against her and biographer Uwe Klöckner-Draga called her a devil. But she lived comfortable from Harvey's money until she died in 2007 and she was buried beside her at the Cimetière de Rabiac in Antibes. 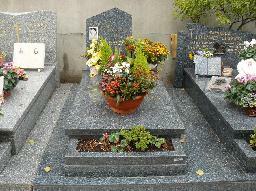 The grave of Lilian Harvey at the Cimetière de Rabiac, Antibes.